As I am oft to do, I randomly searched Amazon for baseball-related material. I don't quite remember the combination of terms that led me here, but I found myself intrigued and perplexed by an offer for something called, "Baseball Tarot." I believe it cost me five bucks. Maybe not even that much. Brand new. I will say the packaging is quite ingenious. The whole thing comes a thick fold-out arrangement with the book (with which to interpret the cards) on one side (it can be removed for easier reading) and the deck of 78 cards on the other. Since this was new, I had to remove the celophane from the package and from the cards. I know very little to nothing about tarot, other than I know one shuffles the cards, deals them, then flips them over in a certain arrangement in order to decipher one's future - or something. I dunno. Anyway, this is the same thing, but relates the entire process to baseball. I found the tie-in quite clever and amusing. As you can see, the cards are quite a bit bigger than a standard card (shown by the 1987 O-Pee-Chee Dennis Lamp above). The book is very well thought out, I have to admit. I really expected some goofy baseball tie-in, and though there is certainly some of that in the book, much of it actually can be applied to baseball and life (in terms of the writing and organization. What you do with the actual readings is in your hands, as it were). 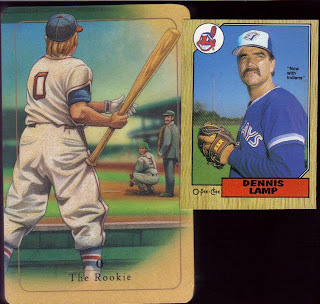 For example, when laying out the cards, one can employ a "Ball, Strike, Out" or a "Who, What, I Dunno" or a myriad of other baseball-related scenarios. Each scenario is explained for the person wishing to partake in a reading. 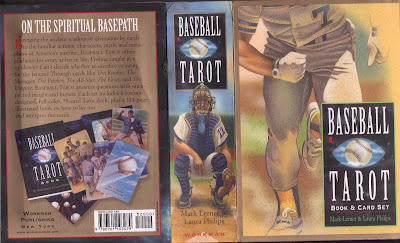 Though I don't give a rip (pun intended, after all we are talking about a "pack" of cards here) about tarot readings and the like, I think the tie-in to America's pasttime was (is) very well executed in this little package. For the novelty alone, it was worth the five bucks I spent.